This week at HBHQ marked the eagerly anticipated arrival of the game Wasabi!, and boy, is it ever cute! The premise, the pieces, and game play all follow the sushi theme to a T. Possibly the only things missing from it are soy sauce and chopsticks (though maybe not if you’re a purist). Side note: Did you know that sushi is a finger food? It’s actually easier to eat that way; give it a try next time! Anyway, we couldn’t even get halfway through reading the rules during our test spin before we broke down and just had to order some sushi for lunch. Even now as I write about this I’m getting hungry for sushi. In fact, everything about Wasabi! seems to have that Pavlov sort of effect. It’s really that well done. We’re in love with the game pieces and graphics, and the whole shebang seems built to last. But it’s not just all style. There’s great substance, too. Quick to learn and easy to play, but with ample opportunities for strategizing upsets (“You blocked my Dynamite Roll!”), it would enhance any game night with family or friends — and even more so if those friends are foodies or sushi lovers! 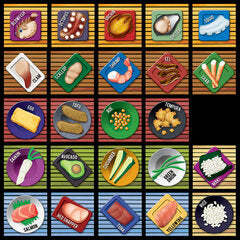 Opponents pick starting ingredients for each other, everyone gets three recipe cards to shield away in their menu screens, and the sushi making begins. Players take turns laying down ingredients on the rolling mat playing field in an attempt to complete recipes, which are then rewarded with points and wooden wasabi cubes that sit in their little bowl as you earn them, silently and subtly taunting the competition as a testament to your sushi chef prowess. There are a couple different ways to win, so you’ll have to decide what your angle will be: quantity over quality, or some combination of both? Wasabi! is definitely a top-notch game; we can’t enthusiastically recommend it enough. And now to satisfy that sushi craving…. Till next time!